A November Sunset on the coastline at Point Pinos, Pacific Grove, California, USA. Although it was the beginning of "blue hour", there was still enough light to cause the rocks to just glow. Long exposure (105 seconds) of the Lone Cypress at Pebble Beach near Carmel California. The day was decidedly grey and using a long exposure to add even more mystery and atmosphere to the scene. Clear skies on the horizon and the incoming tide mark the Asilomar State Beach coastline on my first morning of independent shooting in Pacific Grove, California. A golden glow as the sun sets off Point Pinos in Pacific Grove, California. Waves crash on the rocks at Garrapata State Park south of Carmel, California. Afternoon sun on McKay Falls at Julia Pfeiffer Burns State Park south of Big Sur, California. 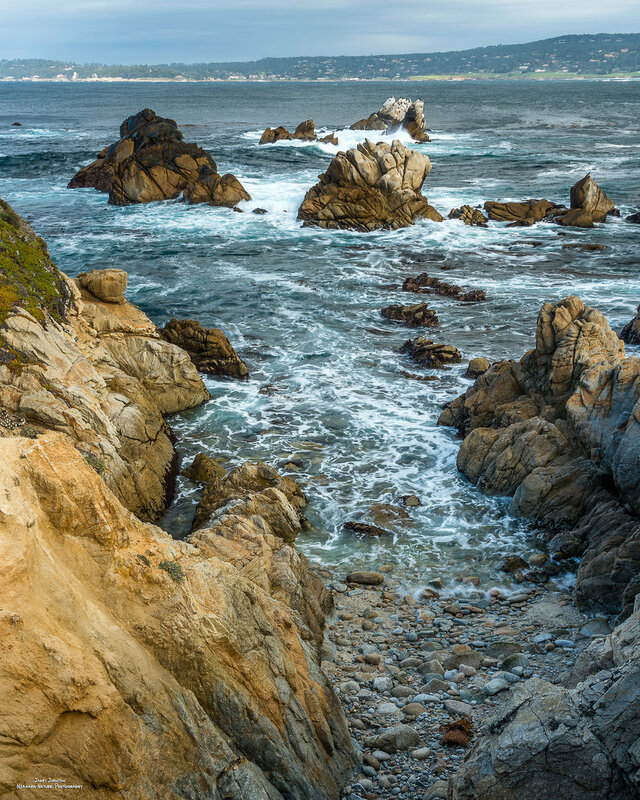 Carmel can be seen on the opposite shore in this image from the shoreline at Point Lobos State Park. 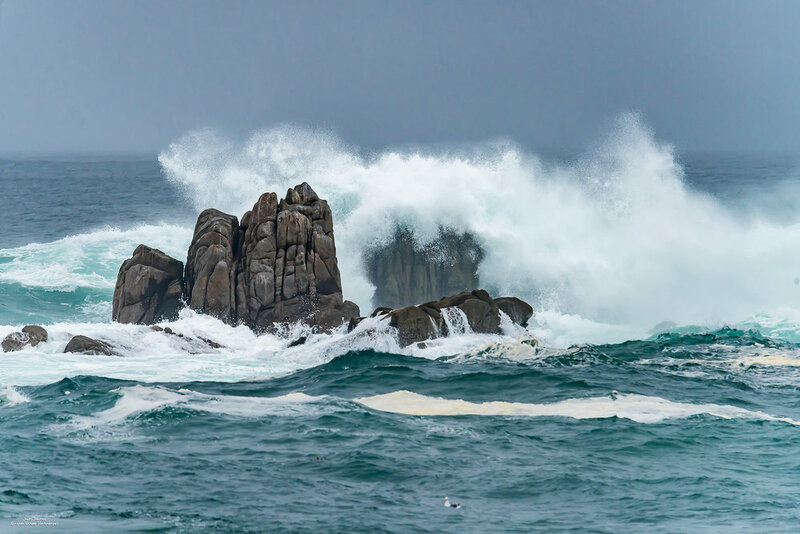 Stormy seas off Point Pinos in Pacific Grove. Southern view of the coastline at Garrapata State Park south of Carmel, California. A lone Sea Lion sunning itself on a buoy in Monterey Harbor. The upraised tail flukes of a diving Blue Whale off the Monterey Coastline. Blue Whales rarely lift their tales when diving so this was a treat. A Sea Lion jumps from the water and looks toward my watchful lens. This Sea Lion did this for quite a few minutes, either playing or feeding, I was never quite sure. A colorful Crab watches for threats from it's crevice in the rocks during low tide on Point Pinos. The glow of the setting sun illuminates the rocks off Asilomar. Low tide ends and the ocean begins to creep back in amongst the rocks on the Pacific Grove coastline. Scottish Highland Sheep resting in a pastoral setting on the Mission Ranch in Carmel, California. Strong waves crash off the rocks on the southern shoreline of Point Lobos, just inland of the Memorial Cypress Grove. 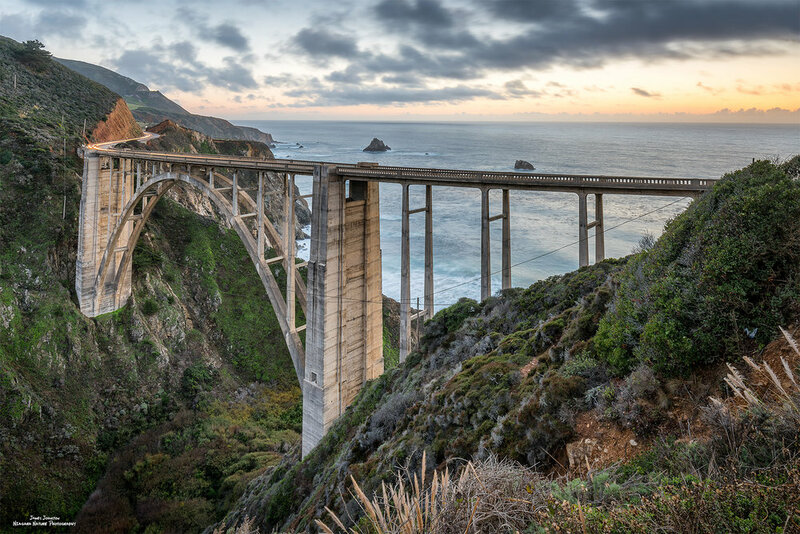 The fading light of the sun bathes the iconic Bixby Creek Bridge in golden light. This bridge has been photographed many times and is frequently used in Automotive commercials. Elephant Seals rest after completing their Fall migration from Alaska to the shores off San Simeon, California. Mating and birthing season begins in earnest with the arrival of the big bull seals in Late December and early January. A toned black and white image of the "Lone Cypress" on the 17-mile drive in Pebble Beach, California. This is the single most identifiable location for photography in the Carmel area. I wanted to put my own spin on the image by doing a long exposure on a stormy day. B&W sunset image of the rocky coastline at Asilomar State Beach in Pacific Grove, California. Number five in my "Lillies" series showing the texture and light of various lily plants was taken at the Mission Ranch in Carmel, California. See the other images in the B&W Gallery.